Welcome 2019! Love Bachata? 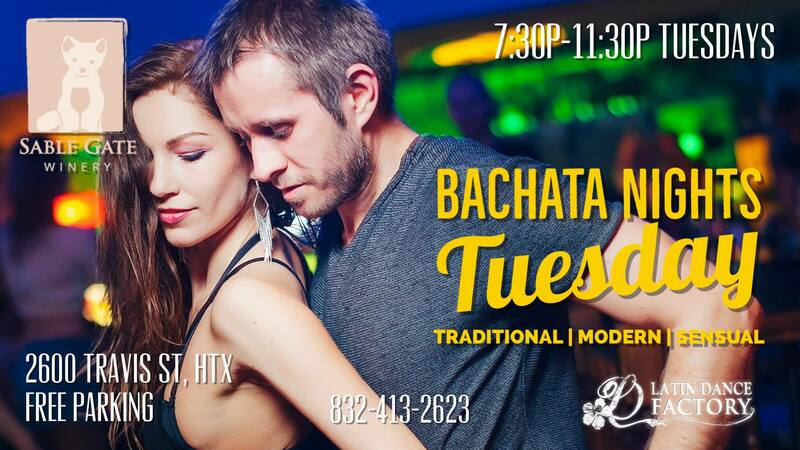 Get ready for a Free Bachata Social dancing every Tuesday night! Happening at the beautiful and stylish Sable Gate Winery in Midtown! Social format: great music, great people, everybody dancing with each other to practice and increase the level. This is what we have for you! ✓ 9:00-11:30pm Bachata Social Dance Party – Free! ✓ DJ Party Format: 60% Modern / Traditional Bachata | 30% Sensual | 10% Tropical. ✓ Free street parking on Travis, Milan, and Dennis St.
✓ Event is 18 and up! 21 and up to drink. As far as DJ – it is collaboration. I’ll play my tunes and I always keep updating them, but If you requests, we are happy to play them as well. We will mix Sensual, Traditional and Modern styles so everyone is happy. Let your friends know! You don’t need to know Bachata to join. Everyone helps each other. *Open Level means – if the crowd in the majority is beginner, we will do a Beginner class. If the crowd is intermediate, we will do an intermediate class. If the crowd is mix (beginners and intermediate) we will do a bit of everything so everyone gets the most of the class! Like Us for more parties!